Say hello to your favorite country with these lovely hand embroidered pillows. Ciao! Top of the morning! Cheerio! Bonjour! And shalom! 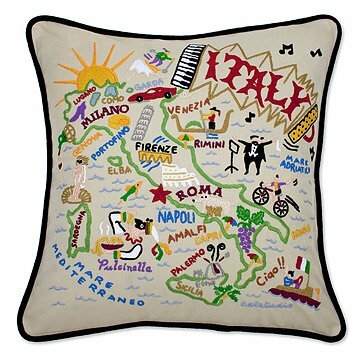 Say hello to your favorite country with one of these lovely hand embroidered pillows. Whether you studied abroad in one of these locales, had a memorable vacation or trace your family roots back to the old country, these are a wonderful way to remember and pay tribute. Featuring hand embroidered pictures of attractions, culture and characters, black velvet piping and soft polyfill. Handmade in India. Click here to see all available Country Pillows. Carmel and Terrell fell in love and discovered they shared anthropological backgrounds and a thirst for travel. They also had a joy & deep appreciation for art, design and craftsmanship. Today you'll find the Swans living in picturesque Petaluma, a quiet Northern California town nestled amongst dairy farms and rolling hills. Of course, they continue to travel to all parts of the world - you could say it is their business, and you would be right. The craftsmanship on this pillow is spectacular ! The detail is amazing ! The best pillow! Great for it's design, beautiful and the perfect napping pillow. I love it! Lovely pillow. Great design. But it has a really bad odor. Trying to air out. Hope I can salvage it. what the heck!? No Mexico?? These are beautiful, but I'm dissapointed that there is not one for Mexico. I feel a little left out. If there was a Mexico one, I'd def buy it! I got this pillow for my husband because we are moving to England, due to the military. He absolutely LOVED it! This pillow is loved my men and women alike. At first I didn't want to get it because I thought it was too expense. I ended up getting it anyway because I just knew my hubby would like it. If you are having second thoughts because of the price...BUY IT ANYWAYS!!! Love love love this pillow! I would order more in a heartbeat. A great gift to remind your favorite traveler of some of their favorite places in the world. When I return from a country I love, the best thing to have is a decorative pillow as a remembrance. They also make great gifts for people who travel and have a favorite place.